Don't Waste Time! Top 17 Things To Do on Ambergris Caye, Belize — Sapphire & Elm Travel Co.
Ambergris Caye, Belize is an eventful gem full of friendly locals with no shortage of things to do for everyone from beach bums to nature enthusiasts to adrenaline junkies. My first stop, in what would be several weeks in Belize and 4.5 months in Central America, was the island of Ambergris Caye. It is the largest island in Belize, and a popular tourist spot known for it's crystal blue waters, scuba diving, snorkeling, beautiful beaches, the coral barrier reef (second only to Australia's Great Barrier Reef), and English speaking locals. San Pedro is the only town on Ambergris Caye, with lots of restaurants, shops, bars, tour companies, and hotels, but this large island offers a lot more than this town. After spending a week on the island, I am recommending a few places and activities on the island. For those certified scuba divers, Belize offers magnificent options for diving the Barrier Reef. Snorkeling is an excellent alternative! Be sure to look into Hol Chan, Shark Ray Alley, South Channel, Coral Gardens, Turneffe Atoll, Light House Reef, Love Tunnel, Angle Flats, Eagle Ray Canyon, Cypress Garden and Bacalar Chico. Ironically named Secret Beach is touted by the locals. It is a can't miss beach for it's away from the main row of hotels, restaurants and bars in and around San Pedro. A bit quieter and has ocean volleyball, a trampoline, kayaks and much more. TRAVELERS TIP: Rent a golf cart for a least a full day to be able to explore the island in it's entirety! For the coffee lovers like us, Rum + Bean coffee shop is quaint, eclectic and offers authentic options for coffee like iced coffee with coconut water - delicious! Also serves up alcoholic beverages, has wifi, air conditioning, adorable decor, and a few small bites like rum cake and ham and cheese scones (which were fresh out of the oven when we arrived, yum!). Dive, snorkel or fly over The Great Blue Hole. No matter how you get there, The Great Blue Hole in Belize is something not to be missed! The Palapa Bar is an Ambergris Caye stable. Come for the always friendly staff, signature dishes and drinks, carefree crowd and float on the inner tubes with views of the Caribbean ocean! This island offers a variety of ways to spend the day active on the water. You can go wind surfing, kite surfing, jet skiing, paddle boarding, kayaking, wake boarding and more! 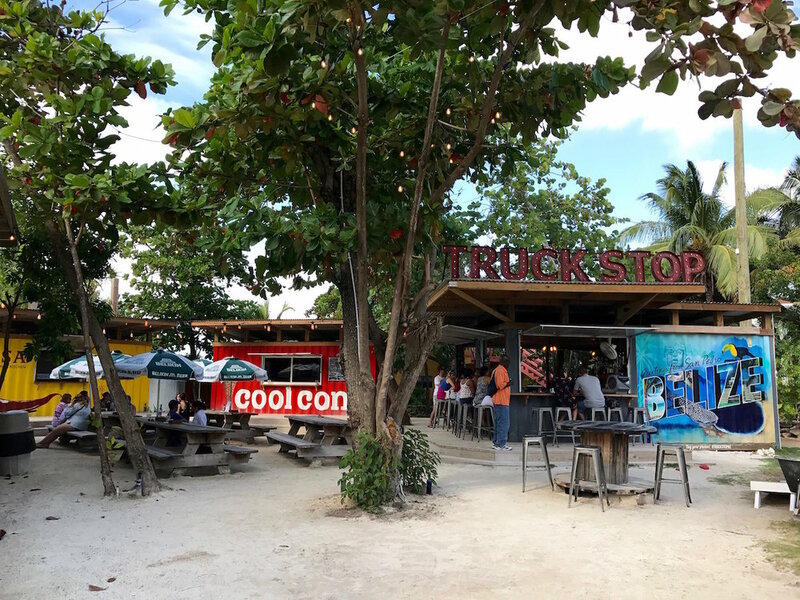 The Truck Stop Belize is a shipping container food park serving up local fare, tacos, margaritas, beer, ice cream, and so much more. TIP: Wednesday night is movie night, Thursday night is trivia night, Friday night is family movie night, Saturday night is DJ night! This open yellow building is primed with Belize locals and ex-pats. There are about a dozen rounds, and you pay per board per round. Rounds differ in what type of BINGO you're going for, i.e. regular BINGO, BINGO only using the B column, blackout board, etc. Winnings vary based on the number of boards purchased each round and the number of winners. There are daily yoga classes at Ab'kol Resort north of the bridge, Monday through Saturday at 9am, and Sunday at 10am. Yoga classes take place in a stunning palapa over the water. There's a restaurant, bar and pool on site as well. They also offer classes on the yoga sutras and more! Every Thursday night at the Spindrift Hotel, you can bet on which square a chicken will "drop" on. "Drop" is a classy term for poop - you're betting on which square the chicken will poop on. This water slide is in the El Diablo Bar & Aqua Park, located at the end of the Caribbean Villas Hotel dock. This waterpark is the only of it's kind on the island, and includes this giant slide, a zip line over the sea, a water trampoline, and other fun amenities. Taste the Belize chocolate difference at the Belize Chocolate Company, a family owned bean to bar artisan chocolate maker using certified organic, fair trade and direct trade from small family farms in Southern Belize, and Belizean cane sugar to make their signature Belizean chocolate. They offer a chocolate class which explains the chocolate making process from the cacao beans grown here in Belize to the making of the chocolate. The class offers samples of our chocolate as well. The class is offered at 10:30am every week day and the cost is $15BZ per person. The class usually takes about 30-45 minutes. They can also do private lessons! San Pedro is known for being a non-stop party town. With so many visitors, there’s a party every night. The beach is lined with bars and restaurants to explore - many of which have live music every night of the week! Favorites include Fido's Courtyard & Pier, Crazy Canucks, Wayo's Beach Bar, Palapa Bar, Rojo Beach Bar, Truck Stop, and Finn & Martini. Cozy Coconuts (previously Island Time) is a bar/restaurant on the water, and has a bowling alley set up on the beach. It was extremely windy when I was there, which unfortunately meant the pins could not stand long enough for me to bowl. But if you go on a calm day, this is a fun activity! Join Crazy Canucks every Tuesday night at 6:30pm for some crab racing fun! Get in the action and bet on your favorite hermit crab for $10BZE. While the most impressive Mayan ruins in Belize are located on the mainland, Ambergris Caye is home to one designated Mayan site: Marco Gonzalez. Since the island was once home to more than 20,000 Mayan traders at the height of their civilization, there are ruins left on the island. This site is new and relatively un-excavated. Here you'll find small mounds or ceremonial caves rather than large structures like you will find at Xunantunich, Cahal Pech, Lamanai and Tikal in Guatemala. However, it does make for a fascinating half day trip to the south side of the island and a good introduction to this ancient civilization. While the Caribbean side of Ambergris Caye gets all the attention, the lagoon side is also not to be missed! Rent a boat and head to the west side of the island for some fishing, snorkeling, bird seeing and even spotting dolphins and manatees, stop at The Office for food and drinks or watch the sunset. Or join the American Crocodile Education Sanctuary for a crocodile expedition and tour where you'll cruise through mangrove habitat into the night and search for crocodiles, birds, and other nocturnal wildlife. Tour takes place 6:00pm and costs $50 USD. Does Ambergris Caye, Belize sound like an amazing adventure? Contact us to create a unique travel experience just for you. The Big Belize Debate: Ambergris Caye vs Caye Caulker?